The Wedding Outfit of the Bride. It could be a Saree, Lehenga or a Salwar depending on the Community & Personal Preference of the Bride. Shaadi Ka Joda in Punjabi. Worn on the Wedding Day, the outfit is mostly chosen in Red, Maroon, Green, Magenta or any other colour combined with Gold threads. The Wedding Outfit is the first of the Solah Shringar that is adorned by the Bride. The outfit is generally very rich made from silk and would be embellished with Precious Stones. Outfits with a lot of Gold would be preferred as they are considered to be auspicious. From the Big Designers to the small apparel stores, all of them stock-up on Bridal Wear. The kind of outfit adorned by the Bride differs with each community. For instance, the Brides from the South would generally wear a Silk Saree, preferably a Kanjeevaram for their Big Day. 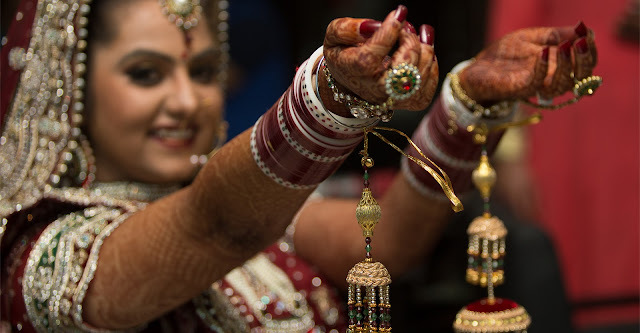 The Bridal Saree is draped differently depending on the region or the community she belongs to, for instance the South-Indian Iyer Bride wears a nine yard saree called the Madisar. The Gujarati style of draping the saree is very popular with most brides too. The Sardarni Brides would wear a Salwar Kurta or a Lehenga for their Gurudwara Wedding, also called Anand Karaj ceremony. Christian weddings have their own style that is mostly White Gowns, few go with simple version, while most of them go for the Designer Gowns.